Hello, my name is Flor and I participated in Youth Leadership Adventures in 2014. 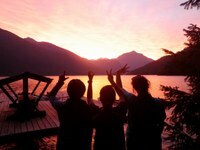 I hope that you’ll consider making a contribution to North Cascades Institute. You won’t just be supporting a student for one trip; you’ll be supporting a student to have a whole new perspective on life that will carry into the future. That’s how you supported me. I signed up for the 16-day Science and Sustainability course after a friend urged me to apply. I was hesitant because my family was not financially stable at the time due to medical costs from an illness. But the people and the program really drew me in and knowing scholarships were available made it possible. Before Youth Leadership Adventures, I had been on a few day hikes but I had never hiked or backpacked surrounded by wilderness. The idea of being outdoors for 16 days was daunting at first. Once I experienced it and learned how to embrace living in the outdoors it was hard to leave. My instructors, Katie and Carolyn, were incredible. They taught me not only the basics of backpacking and outdoor living; they taught me how to be a real leader. 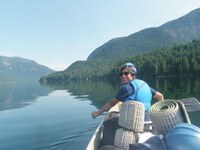 The daily backpacking, canoeing and stewardship activities included temporary leadership roles for everyone in the group. These roles helped facilitate our teamwork and helped us grow out of our comfort zones. One day we hiked Desolation Peak, 4,400 feet of elevation gain in a little under 5 miles, to work on the trail. All in my group, the Burrito Blitzers, were exhausted from the challenging hike and the canoe trip back to our camp in strong winds on Ross Lake. But, together, we persevered and were surprised and delighted when Mother Nature painted the sky with beautiful hues for a stunning sunset. Being away from daily life taught me to be more comfortable with myself and learn how to value the relationships I have with those around me and with the environment. I learned so much about each member of my group and about myself as we worked, reflected, and grew together as a team. Hearing a National Park ranger talk about glaciers and geology showed me first-hand how much our environment is changing and the importance of water resources. My experience outdoors with North Cascades Institute has given me a new view on the relationship between nature and myself. tomorrow with others. Last year, I encouraged my younger brother Hector to apply and he did. I have seen his consciousness and actions related to what he learned on his Youth Leadership Adventure trip grow. My parents have also started spending more time outdoors after hearing about my experience and enthusiasm from my trip. The changes this program brought to my life have astounded me. After Youth Leadership Adventures, I graduated from Burlington-Edison High School and am now a freshman at the University of Washington. 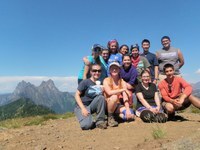 I have become a part of the Northwest Women at UW Club, which helps women of all ages and backgrounds at the university get outside and explore while also fundraising for environmental causes. I’m also continuing my interest with mentorship that started in high school where I helped freshmen navigate high school life. I am now a mentee with Leaders Del Futuro, a group that mentors Latino students, and I hope to become an active mentor next year. I also want to give back to North Cascades Institute and am excited to have been selected as a Youth Leadership Adventures apprentice this summer so I can inspire change in students’ lives by connecting them to the outdoors. Youth Leadership Adventures is a program that opens up a whole new perspective on the way we view nature, a program that tests your limits while still creating a strong community for support and trust. The experiences at North Cascades Institute provide students with lifelong lessons and create deep connections between students and the outdoors. It is only because of your charitable contributions that all of this is possible. Thank you so much for making a gift so that together, we can make an impact on the next generation and on the world.